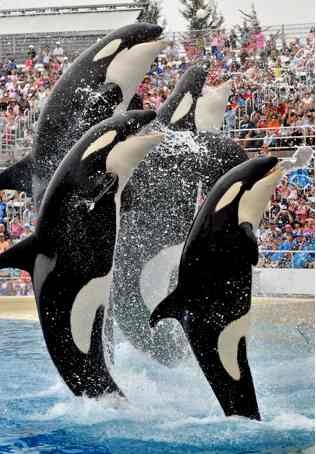 Visit Sea World San Diego, a delightful marine theme park in the heart of Mission Bay, San Diego, California. Here you can see dolphin and whale shows, enjoy a summer fireworks show, enjoy some Sea World Rides, and even swim with the dolphins! Four of SeaWorld’ San Diego’s killer whales leap out of the water during “Believe,” SeaWorld San Diego’s killer whale show. Photo courtesy of SeaWorld. This is one of our favorite Southern California theme parks. It offers a variety of marine life, shows, rides, fireworks and loads of fun. In 2017, they are changing their shows to be more animal friendly. SeaWorld has recently opened Aquatica Water Park in San Diego, so check that out too if you are visiting in June - September. Cirque de la Mer Special summertime show featuring acrobatics and mysterious creatures. Blue Horizons - Blue Horizons is a spectacular show featuring dolphins, pilot whales and exotic birds. One Ocean - Sea World San Diego killer whale show, "One Ocean" features Shamu and other killer whales. Shamu Rocks - Summer killer whale show with some rock n roll. This will be replaced in 2017 with a new animal friendly show. Shark Encounter - At SeaWorld San Diego’s 280,000-gallon Shark Encounter, guests come “uncomfortably” close to a dozen species of sharks. 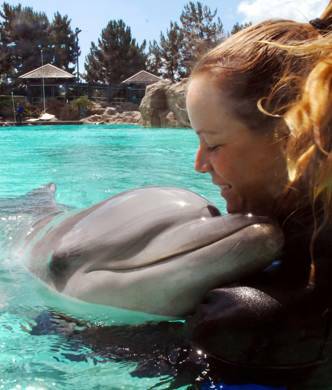 Dolphin Interaction - During SeaWorld San Diego’s Dolphin Interaction Program (DIP), participants get an amazing in-water experience with bottlenose dolphins in the DIP pool at Rocky Point Preserve. An awesome experience that requires and extra fee. Reservations recommended. Dolphin Encounter - At the Dolphin Encounter, guests can get close to bottlenose dolphins without getting in the water. 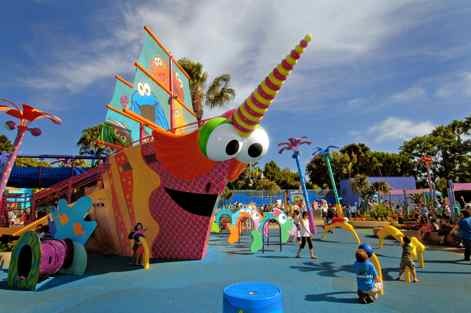 Sesame Street Kids Play Area - Sesame Street Bay of Play at SeaWorld is a two-acre, whimsical play area that features family-friendly rides, character performances and interactive play elements. Water Coaster Journey To Atlantis - Try Sea World San Diego thrilling water coaster, featuring twists and turns, and a splashy, 60-foot plunge. 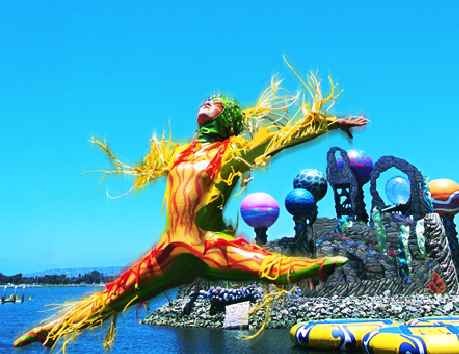 Plus many more Sea World Rides, shows and things to do at Sea World San Diego theme park. Sea World San Diego is a premier aquatic theme park in San Diego CA, in Mission Bay Park. SeaWorld Hours: Daily. Hours vary, but typically open at 10 AM during the off season and weekdays, and 9 AM summer and weekends. Closing time varies, but open later summer and weekends. SeaWorld Water Park: In 2013 SeaWorld opened their San Diego Aquatica waterpark for even more fun. The park is open seasonally. For more information see Aquatica Water Park. Ticket Prices: $93.00 adults and youth ages 10 and up, children ages 3-10 $87.00. There are many special discounts and combination passes with other Southern California attractions. See our Sea World Discounts page for more information. Food: Eat at the park, or you can picnic at nearby Mission Bay Park. Dog Kennel Service: If you have your dog with you, bring him to the pet facility. For $10 you can keep him in a 4 ft x 8 ft kennel. Bring your own food and bowls, water is available. First come basis so arrive early. Directions to San Diego SeaWorld from I5: From Interstate 5 take the SeaWorld Dr. exit and head West one mile. Directions from I8: From Interstate 8 go north on Interstate 5 to SeaWorld Dr. and turn West towards the park entrance. Click on the link above to open the Google Map for SeaWorld and other attractions in San Diego and southern California.